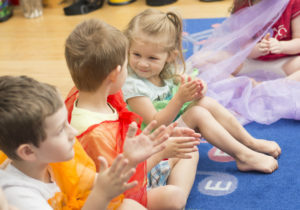 Your introductory class will give you a delicious taste of the joy, connection, growth, family time and heart that we create with our Kindermusik community. Music? Yes. But we’re so much more! You’ll see your child’s eyes light up as we dance, play, sing, and learn with loads of new friends and grown-ups who want the best start for their child. Introductory classes are 15.00 which we will happily apply to your registration fee when you enroll. Fill in the form below and Ms. Chris, our Studio Concierge, will be in touch to help you schedule your first step on your Kindermusik journey. I’d love an Introductory Class!